Bismarck, ND – Leaked documents created by military intelligence contractor TigerSwan, recently obtained and published by The Intercept, provide a previously unseen look inside the operations taken by Dakota Access Pipeline (DAPL) security contractors against the #NoDAPL movement. TigerSwan was contracted to coordinate DAPL security operations in September 2016. The extensive coordinating role of a private nonprofit, the National Sheriffs Association, also turns up in the documents. TigerSwan, founded by Delta Force veteran Jim Reese, first worked for the State Department doing counter-terrorism operations in Afghanistan. Reese has formerly advised Blackwater, the disgraced paramilitary firm whose employees gunned down seventeen Iraqi civilians in the 2007 Nisour Square Massacre. The leaked DAPL security documents show a vast, interstate private surveillance network aimed at identifying, tracking, profiling, and repressing anyone affiliated with the #NoDAPL movement. Emails also show that TigerSwan has never been licensed to operate as a private security company in North Dakota, despite doing so for nearly the entire span of the #NoDAPL movement. The emails, briefings, and situation reports show a high level of coordination between TigerSwan and local and state law enforcement in North Dakota, with DAPL security employees often providing intelligence or directing law enforcement’s response to pipeline opponents. TigerSwan records also show pipeline security working directly with the ‘Intel Group’ – a collection of federal, state, and local law enforcement working to collect information to identify and prosecute people allegedly involved in #NoDAPL direct actions. TigerSwan provided direct assistance to the US government “Intel Group” by directly forwarding them photo and video they collected at #NoDAPL demonstrations as well as providing them with access to a live helicopter video feed during their daily flyovers of water protector encampments. 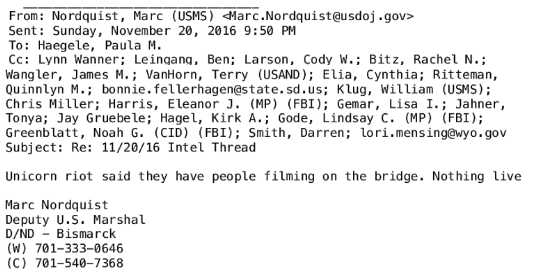 One Intel Group email thread from November 20, 2016 (published in part two of the Intercept’s reporting on the TigerSwan leaks) shows personnel from various local, state, and federal agencies monitoring livestreams and social media postings from the incident that came to be known by some water protectors as “the Battle of Backwater Bridge.” One of the emails mentions Unicorn Riot by name, in which assistant U.S. Deputy Marc Nordquist comments on the presence of our reporters on the scene that night. Many of the reports also show DAPL security and/or law enforcement closely monitoring peaceful, legal events, such as fundraiser concerts and permitted first amendment rallies, as opportunities to conduct surveillance and gather personal information on activists. TigerSwan repeatedly sought out anti-DAPL events and gatherings in Illinois, where the pipeline ends, despite no direct actions against the pipeline ever having occurred there. One TigerSwan report-back from a #NoDAPL protest at an Army Corps of Engineers office in Chicago signs off with the assurance that “manifestation of the anti-DAPL sentiment will continue to be monitored closely.” The same report also demonstrates TigerSwan’s heavy use of Open Source Intelligence (or ‘OSINT’) gathered via social media, at one point referring to analysts “data mining” the personal information of Chicago-area people who signed up to attend a pro-Standing Rock event on Facebook. In addition to gathering information on individual “persons of interest,” part of TigerSwan’s stated mission is to protect DAPL’s reputation. Many of the leaked documents show concern with both the public’s perception of the pipeline as well as efforts by water protectors and journalists to uncover information about DAPL security contractors. Online content monitored and forwarded by TigerSwan included the hashtag #NoDAPL on Twitter, a DeSmogBlog investigation into TigerSwan’s past work for BP, as well as the Facebook page Bakken Pipeline Resistance. TigerSwan is also closely involved with the National Sheriffs Association, a little-known nonprofit organization that played a large role in coordinating security operations to protect the Dakota Access Pipeline from Indigenous resistance. proud to have you guys! North Dakota law enforcement faced a staffing shortage almost as soon as the #NoDAPL movement kicked off, and was only able to successfully midwife the pipeline to completion with the assistance of hundreds of out-of-state law enforcement officers. This process of importing police from other states was legally done under the Emergency Management Assistance Compact (EMAC), but on the informal, personal, day-to-day level, much of the coordination and messaging for the multi-state DAPL police operation was carried out by the National Sheriffs Association. The National Sheriffs Association (NSA), a private group made up of publicly elected sheriffs, sent a letter in October 2016 to the Department of Justice demonizing #NoDAPL water protectors as violent drug users and asking for increased federal support to the Morton County Sheriff. Hennepin County Sheriff Rich Stanek, based in Minneapolis, is currently the “3rd Vice President” of the National Sheriffs’ Association. 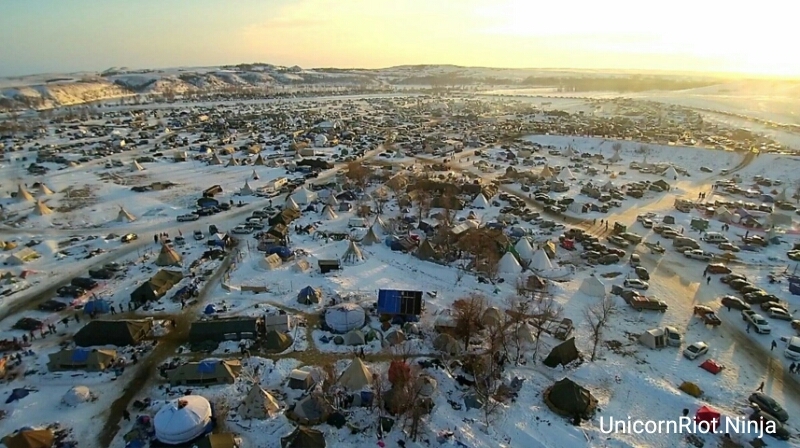 The sheriffs deputies he controls were critical components of the large police attack on the Oceti Sakowin Treaty Camp on October 27, 2016 [VIDEO] with the approval of the Minnesota Department of Public Safety. Unicorn Riot documented that the deputies had removed their otherwise standard nameplates during the attack. On October 28th a rally at Minneapolis City Hall compelled NSA vice president Stanek to withdraw his forces. 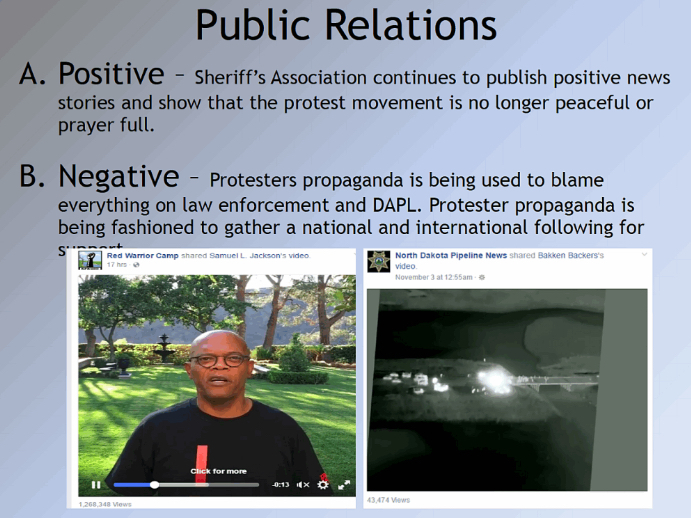 A slide from a TigerSwan ‘Shared Daily Intelligence Update’ for October 16, 2016 cites PR work done on DAPL’s behalf by the Sheriff’s Association. A leaked recording of a December 2016 Energy Transfer Partners (ETP) board meeting features ETP COO Matthew Ramsey boasting of their company’s collaboration with the National Sheriffs Association to work against the #NoDAPL movement. TigerSwan is listed on the National Sheriffs Association website as a corporate sponsor. The cozy relationship between TigerSwan and the National Sheriffs Association fits into a well-documented pattern of oil and gas interests working hand in hand with law enforcement to conduct counterinsurgency campaigns against indigenous peoples and environmentalists who oppose fossil fuel projects. TigerSwan’s militarized approach to surveilling, disrupting, and encouraging prosecution of water protectors echoes past use of counterinsurgency techniques by fossil fuel corporations against their opponents. Similar to some of the TigerSwan materials is a 2010 strategy presentation made by the private intelligence firm Stratfor for Canadian oil giant Suncor, published by Wikileaks after an Anonymous hack in 2011. The power point presentation describes how to better control environmental movements by dividing them into categories such as ‘Idealists’, ‘Realists’, ‘Opportunists’, and ‘Radicals’ – with one of the main goals being to isolate the ‘radicals’. 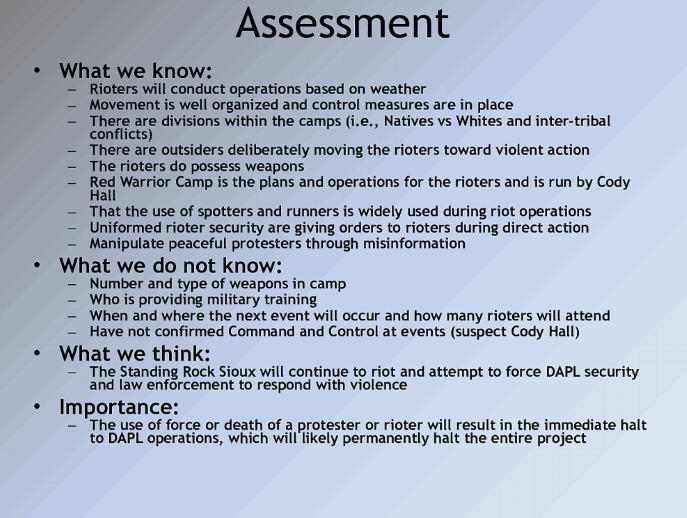 Identifying and neutralizing the radicals, or ‘agitators’ within the #NoDAPL encampments was a stated goal of local and state police, the National Guard, as well as TigerSwan intelligence personnel. In the documents published by The Intercept, state, local, and federal agencies, as well as TigerSwan, express concern with Red Warrior Camp somehow controlling the larger body of water protectors. The reports and emails also repeatedly claim that Cody Hall, former media spokesperson for Red Warrior Camp, was somehow acting as a mastermind or ringleader. A recurring theme is uncovering what perceived leadership (or “Command and Control”) is responsible for direct actions that stopped pipeline construction. TigerSwan analysts appear to be unfamiliar with the decentralized organizing models favored by modern direct action movements, and seem to seek out information that fits into an assumed militaristic, hierarchical structure. TIgerSwan did not respond to The Intercept’s request for comment on the initial story with which the leaked DAPL security documents were published, and has not yet publicly responded to the leaks. TigerSwan’s Twitter feed – which seems to mostly be used by founder Jim Reese as a personal account – is generally free of any mention of the Dakota Access Pipeline, except for a retweet of a pro-DAPL editorial in the Wall Street Journal written by North Dakota US Rep. Kevin Cramer in December 2016. TigerSwan also retweeted a link to a December 2016 internet radio broadcast from the right-wing outlet The Blaze, in which Jim Reese expresses his admiration for DAPL employees and North Dakota law enforcement and criticizes water protectors as misguided. “The usage of counterterrorism tactics upon our No DAPL movement is not only extremely disturbing, but feeds into a historical narrative of oppression that Indigenous Peoples and People of Color have dealt with for generations. Many of our brothers and sisters incarcerated across the country for their activism are political prisoners as a result of such disruptive tactics used by companies like TigerSwan. Since The Intercept published their exposé featuring several leaked TigerSwan reports, the @TigerSwan twitter handle retweeted a tweet calling the firm “modern day Pinkertons” – a reference to the Pinkerton Detective Agency, known for violent and sometimes deadly attacks carried out against the labor movement the early 1900’s on behalf of corporate employers. It is unclear if the retweet was done in irony. March 29th, “Tribal Citizens Prepare to Blockade Bakken Oil Pipeline“. April 3rd, “Tribal Citizens Build Camp in Path of Oil Pipeline“. May 5th, “Sacred Stone Camp Resists Dakota Access Pipeline“. May 27th, “Dakota Access Pipeline Blockade Enters 2nd Month“.